William Leon, Joseph Haag, and Christopher Bones wears black high and low top Converse “Chuck Taylor” All Stars in the film. Liv Southard wears red Converse “Chuck Taylor” All Stars in the film. Josh sneaking around campus trying to avoid Ryker. As this short film written and directed by Mark Marchillo opens, we are introduced to Josh (William Leon), a middle school student who is hiding on top of a toilet in one of the bathrooms on the last day of school before the summer break. We soon see why as school bully Ryker (Joseph Haag) comes storming into the boys’ bathroom and slams open all the stall doors looking for Josh. Ryker is unsuccessful because Josh was actually hiding in the girls’ bathroom. Josh escapes for the moment, but as he is quietly sneaking back to class, Ryker sees him, tackles him to the ground, and proceeds to bully him. The film then cuts away to the school office, where the two boys are being disciplined by a somewhat bored principal (Drew Droege), tired of dealing with Ryker’s bullying and Josh’s inability to fight back, what he describes as negative energy. The principal is more interested in getting his “end of the school year paperwork” done (which includes the daily crossword puzzle in the newspaper) than dealing with the situation. Ryker with his girl friend at the fair. 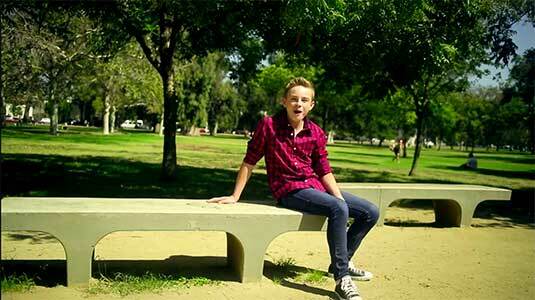 Later we see Josh meeting up with Caitlyn (Liv Southard) and Clark (Christopher Bone) at the fair that is in town. Caitlyn is Josh’s one friend who looks after him, doing things like running interference at the principal’s office. Clark is described by Caitlyn as someone she met at day camp who is rich. Ryker is also at the fair. When he sees Josh, he immediately chases after him. To escape, Josh hides in an enclosed tent. Inside the tent is a gypsy (Lee Meriwether) who tells him that she can solve all his problems. She sells him a magical potion to do just that. Outside the tent, Josh drinks some of it before reading the fine print on the bottle. The print states that he will disappear in 24 hours unless he experiences the kiss of a “true love” before then. Immediately Josh goes to Caitlyn for help, but the magic isn’t there and they are interrupted by her mom. 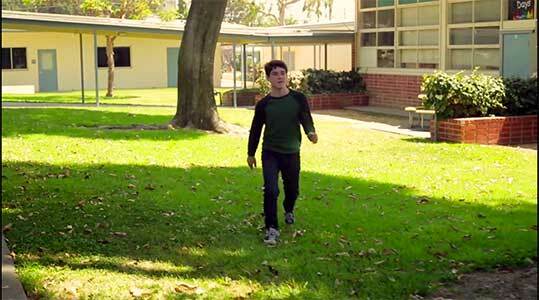 There is a hilarious sequence as Josh runs around town trying to get kissed. 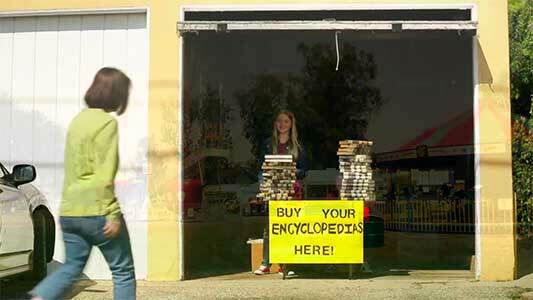 Caitlyn at her home selling encyclopedias. Josh is now getting desperate as parts of his body seem to be fading. Again Caitlyn helps him out; this time by setting up a kissing booth. With no takers, Caitlyn agrees to kiss him but it still doesn’t break the spell. Then Clark comes up and gives Josh an extended kiss. It works as Caitlyn says, “I knew it!” Clark, who tells Josh his name is really Harry, and Josh then perform a song and dance routine based on the old Eubie Blake vaudeville song “I’m Just Wild About Harry.” Josh has happily discovered his true identity as the short ends. Caitlyn’s friend Harry comes to the rescue. Normally we don’t review short films, because you can’t discuss too much without revealing the total story and the films are not always accessible to our site visitors. However all the main characters wear chucks, so The Curse of the Unkissable Kid is worth reviewing on that basis alone. (See also Aliens for Breakfast and Ice Cream Man for a similar presence of chucks in this age group.) 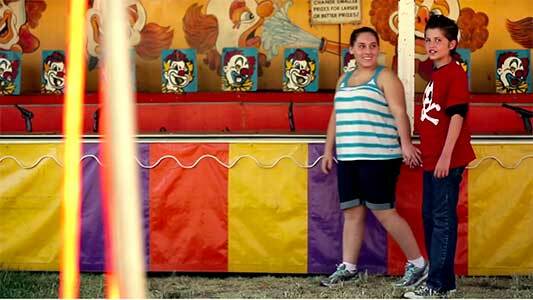 The Curse of the Unkissable Kid is unusual for its genre because it is gay-themed, making it very different from the typical family comedy film about pre-adolescent kids dealing with bullying and coming of age. While European films in this category will often take on more controversial topics and behaviors, it is uncommon in an American made film for this age bracket. American films made for the family genre tend to avoid anything involving sexual tendencies that are not boy-girl. Additionally there is an element of musical theater in the storyline, obviously in the ending but also in the scene with the school principal. Perhaps this is the point of the short: that it is okay for boys to express their true feelings and inclinations even when they are different from most of their peers. The Curse of the Unkissable Kid is available on line for free viewing on You Tube and on Vimeo. Film link: The Curse of the Unkissable Kid. Harry and Josh performing “I’m Just Wild About Harry”. Caitlyn sneaking into the principal’s office to prank Ryker. All of the main young characters in this film wear chucks. William Leon (Josh) is seen in rolled down black high tops, Christopher Bone (Clark/Harry) and Joseph Haag (Ryker) wear black low cut chucks, and Liv Southard (Caitlyn) wears red chucks. The best chucks scene is when Josh and Ryker are in the principal’s office. Caitlyn sneaks in and the camera focuses on Ryker’s chucks as she goes to tie his shoelaces together in a prank that luckily for Ryker gets foiled by the principal. Caitlyn tying Ryker’s shoelaces together. The Curse of the Unkissable Kid. (2013) William Leon, Joseph Haag, Christopher Bones, Liv Southard, Lee Meriwether, Drew Droege, Brady Matthews. Written and directed by Mark Marchillo. Categories: Short, Comedy, Family. ChucksConnection Rating: MPAA Rating: NR, would be PG.